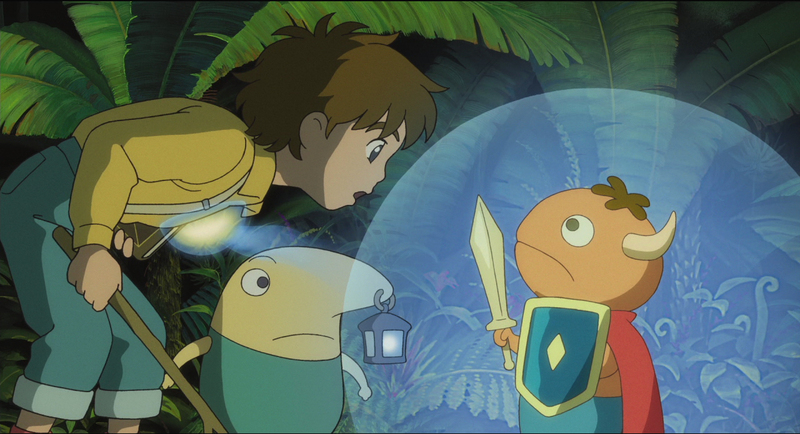 I think I am falling in love with Ni No Kuni too fast for my own good. Despite my attempts to avoid spoilers and hype-building, and even knowing the somewhat mixed reviews the game has received in the press, I fear I may be playing Level-5's JRPG with rose-colored glasses. I fully admit that I am coming into this game with a deep affection for the studios behind the game. Studio Ghibli has animated some of my favorite films of all time. They always imbue their worlds with a stunning sense of magic and wonder. Now, the moment I see a piece of animation clearly produced or even influence by Studio Ghibli, I alight with excitement and open myself up to be impressed. I feel the same way about Level-5, the creators of the beloved Professor Layton series of puzzle games (and Dark Cloud, which I still remember fondly). The Layton games are clearly made with such care and affection for the story and I cannot help but revel in their stories. Above all else, I love that every game is so wholly built in adoration of curiosity and inquisitiveness. Their consistency and care is intoxicating, so much so that I even built a word puzzle in my review of The Last Spectre. With this in mind, who better than these two studios to collaborate on a fairy-tale JRPG? Playing Ni No Kuni, even in the first couple hours, I find myself looking for signs of each studio's touch. I actively search for the wonder and joy I expect, and earnestly, I find it in heaps. However, I also realize my expectations could be coloring my experiences for the better. I am not an JRPG zealot, so I have no instant fuzzy-feelings towards the gameplay, but did you see that little hope my familiar gave!? How cute was that? Speaking of familiars, isn't it amazing how well illustrated and the movement animations appear? Also, isn't it neat how closely the story adheres to children's literature conventions? Really, I go on and on like this. How do I know if my attitude towards this game is too heavily influenced by my preconceptions? Or maybe this is a good thing. Maybe I'm willing to look a little harder than most and find the best parts of Ni No Kuni. I have to be honest -- I'm a little confused what the problem is. Unless you're supposed to be an "objective reviewer" (what's that? ), it sounds like studios you already like pretty much made a game for you. If you're like me, that will help carry you through some of the more frustrating points where the combat demands more from the player than its interface makes convenient, or is just outright broken (hello, enemy skills that cancel in-progress item activations). My wife and I are loving this game in spite of its flaws, but I'm not convinced there's anything wrong with that. Well, no real problem really. I'm enjoying the game, so that's great. The reason this came up at all is because I was having a recent conversation about Dishonored. I'm of the mind that the game takes a little effort to really enjoy. You have to be willing to suffer through some of the game, at least I did, before I accepted the game for what it had to offer. I think it's interesting for Ni No Kuni that my own preconceptions have already primed me to like this game - no effort required, at least not yet. While I'm not reviewing the game, I do try to be fair. I'm just wondering if that's possible in this situation. Either way, I'm rapidly falling in love and I'm thrilled there's so much Ni No Kuni to play. I'm enjoying the game a lot but there are times when it definitely coasts on its charm instead of design. But jeez does it have a lot of charm. I think I'm about 40 hours in? I can't remember the last time I spent this much time with a single-player game. A truly remarkable game. High praises to Namco Bandai, studio Ghibli, Level-5 and all who worked on this project.